Hey everybody, with the holiday weekend coming up, we decided to switch up the nosh show schedule a bit. Are you ready for our quartultimate episode? Wait, that's not a word. Episode 4 of The Nosh Show is now available! 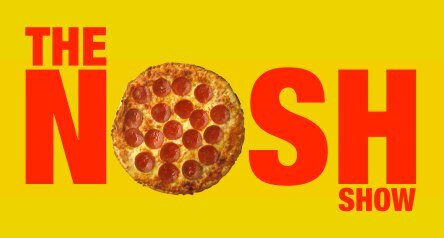 Head on over to The Nosh Show website to listen and to see a complete rundown of everything we talked about. We got a little crazy this including a neat behind the scenes segment as well as the "Nots" of the weekend (instead of the Noshes of the week). Good times had by all and hopefully you're enjoying us getting the hang of this podcast thing. So the big thing I need to share & review with you guys is the new Wendy's Frosty Cone. I knew this was a terrible idea from the start, Nick agreed, and now I can prove it. 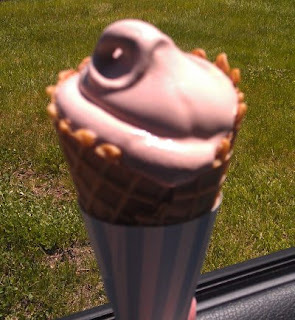 It's not that I'm opposed to frostys or to waffle cones, but let me explain it from a technical perspective. Let's take a frosty, something that is more liquidy than softserve, and then let's put it in a thin waffle cone which has little ability to insulate the frosty and keep it cold. I foresee melted sadness in my future. And look, it's going everwhere. Ignore the fact that they handed me the frosty cone first and then expected me to grab my change and food with the other hand. I've had this for maybe 90 seconds and it's already starting to drip. This was only the beginning. Notice the paper wrapper on the cone. The paper wrapper obviously needs to come off to eat the cone, but when I did that, the cone broke after a few more bites. I'm thinking you can guess what happens next. I would have taken pictures of the disaster but both of my hands were covered in frosty. Yeah, thank you Wendy's for creating the worst frosty holder ever, I'm really enjoying the brown spots on my pants... oh man, it's on my shirt too. I wasted a $1.49 on this trash (I mean that literally, I gave up and threw it in the trash), don't make the same mistake. Disclaimer: Sure, MAYBE your frosty will be served colder than mine, and hopefully it won't break, but do you really want to chance it? Fall 2014 Note: Frosty cones are off the menu! Solution: Wendy's takes all their cones, smashes them to bits, mixes them into frostys with caramel. Delicious-ocity ensues. With the bit of a heat wave attacking NJ this morning, I think of all the little kids who will be having this treat and the parents who'll be cleaning this mess! Ahh! Def a bad call by Wendy's! I agree with Beatrix why not do a special limited edition to use up the cones that was ordered and smash up. Dairy Queen is putting their Blizzards in waffle cones too. Well at least they are here in Canada. Although maybe not as melty as a Frosty, I can see a mess happening. @Laura: yup, we have them too, but the DQ version uses a chocolate lined cone plus soft serve is more solid than frosty mix. 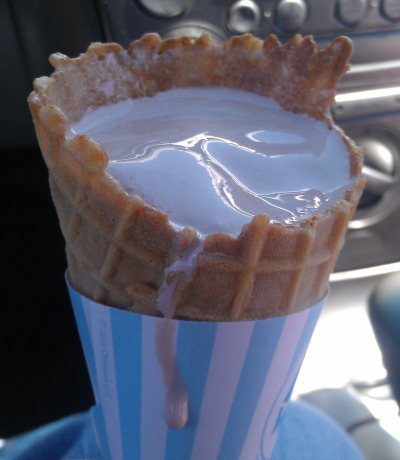 I adore ice cream cones.... but last time I checked, they dont come pre-melted. I'm happy you enjoyed this treat, but if you check the internet, you'll see I'm not alone in my frustration.